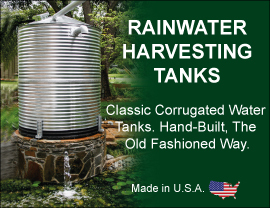 When it comes to drinking water storage and rainwater harvesting, our water tank kits represent the latest in innovation and efficiency for all types of domestic water storage. Designed for harsh and demanding conditions, every tank is manufactured to exacting standards and available in the United States and export to any country. Whether your application is residential, agricultural, commercial or industrial, we have water tank kits to suit most any need. Available in sizes from 3,000 gallon to 700,000 gallons, all of our tank kits embrace new technology and materials by combining a bolted steel construction outer shell with a heavy-duty internal liner. This proven design provides the most innovative and cost effective water tank solution, especially in remote or difficult access locations. Call today to speak to a Water Tank Specialist.